We are a professional, Sheffield based, driving school offering a range of driving lessons and intensive driving courses at competitively low prices. All our lessons last a full hour and our team of highly skilled and experienced driving instructors provide you with the skills and knowledge necessary to become a safe and successful driver. Our fully qualified Approved Driving Instructors tailor your driving lessons around your individual needs, moving quickly on subjects you find easy to spend more time on areas where you require more work. Our lessons last a full hour and are conducted by male or female instructors in our modern, fully maintained cars. So for a professional, reliable service in and around Sheffield with friendly and punctual instructors, contact the dedicated team at Wigham Driving School today! 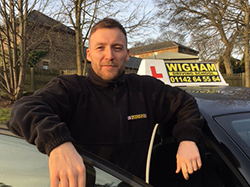 Wigham Driving School offer driving lessons in Sheffield with patient, reliable and fully qualified driving instructors, using a modern fleet of cars.